Drag(*)nball Z: FE is a Dragon Ball Z MUD run on a completely custom codebase that uses the BYOND engine. It was built from the ground-up, and seeks to follow the inspiration started by Trenton's Dragonball Z: Fighter's Edition (DBZ FE) and Rcet's Dragonball Z: Reality (DBZ Reality). Gameplay focuses on a completely interactive combat system, where your character only attacks when you give the order, and your defenses are similarly your own responsibility! Open PVP: Restricted by max power level (no getting ganked when you wouldn't have a chance to win!). 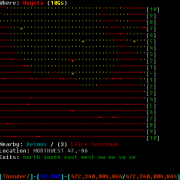 Fully detailed ASCII map: rather than room descriptions, view a map detailing the terrain, nearby NPCs, and players. No conventional levels: Power level increases as you fight, with a substantial bonus for killing blows. Skill-based combat: Dodge and parry your opponent's attacks while countering with your own feints and maneuvers. Long-ranged and energy attacks: strike at your opponent from several rooms away, or unleash a devastating blast at close range. Human, Saiyan, Namekian, Kaio and Android races currently playable, each with its own unique attacks and transformations.